2. Delivery: For small order by express, for large quantities by ocean shipping or air. 3. Payment method: Bank transfer/LC and so on. 1. The best quality best price products. 2. The best and timely service. 4. Custom designs and Logo printed are offered. Full refund unconditionally in the following cases. 1. You don't receive the items or the items are damaged non human factors. 2. The items received are different from the pictures or descriptions. Q1:Does your company is a manufacturer? A1:Our company is a professional manufacturer with over 5 years experience on bridal shoes/party shoes. Q2:How long is the sample date and the production lead time? A2:It’s about 3-5 working days to ship out the samples. It’s about 30-45days after the order details are confirmed. A3:There is NO MOQ,one pair can be accepted. Mix size,mix color,mix design order will be acceptable.If you have any further questions,please feel free to contact us to get more details. Q4:Can the shoes be customized by customer’s logo? A4:The logo could be printed on the sample insole if needed. And besides,we could make the shoes according to your requirement or by your design. 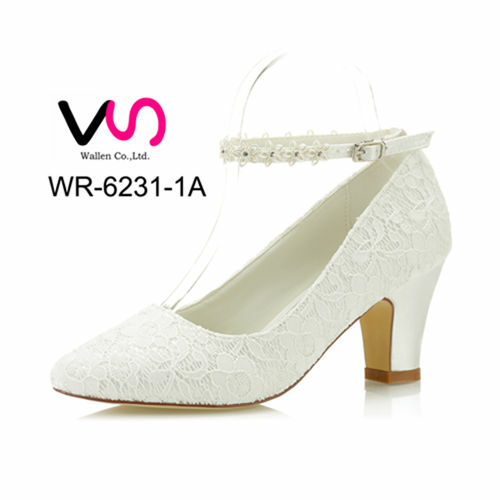 Wallen is a professional Chinese manufacturer of bridal shoes,which located at the developed city Shenzhen,just 1 hour train to Hongkong.We have been in bridal shoes since 2011.Our technician has over 10 years experience on making women shoes.No matter what kind styles you need,we have confidence and strength to provide you with what you need. We are capable of designing and manufacturing various bridal shoes, including party shoes,flower girls shoes etc.We have won our customers' trust through our high-quality products, reasonable prices, considerate and meticulous services. We take product quality as the enterprise's life. We warmly welcome overseas friends for visiting. We strongly believe that our products and services are of your best choice.